Contrary to what some on the left believe, checks and balances are working as they should. A certain cohort of the center Left has never really liked the Constitution very much. I’m talking about the kind of technocratic Clinton-supporting liberal who would, say, rank all the amendments, or write a lengthy article arguing that the American system is doomed because it has a president and not a prime minister. To give these people their due, I don’t think it’s that they have any real antipathy for the document: They just have their own priorities and have never been particularly enamored of the American experiment contra the Swedish experiment or the British experiment or the Slovenian experiment. To each his own, I suppose. But inconveniently for our technocrats, the fact is that our Constitution really is an extraordinary document, and so cases against it tend to be either unapologetically radical or embarrassingly flimsy. The center Left never being much for the radical, it opts instead for flimsiness. Lately, the argument has been circulating that the Trump phenomenon — that he was elected, that he probably will not be impeached in the immediate future, that he has the authority to fire special counsel Robert Mueller — serves as a final, sad testament to the failures of the Constitution. 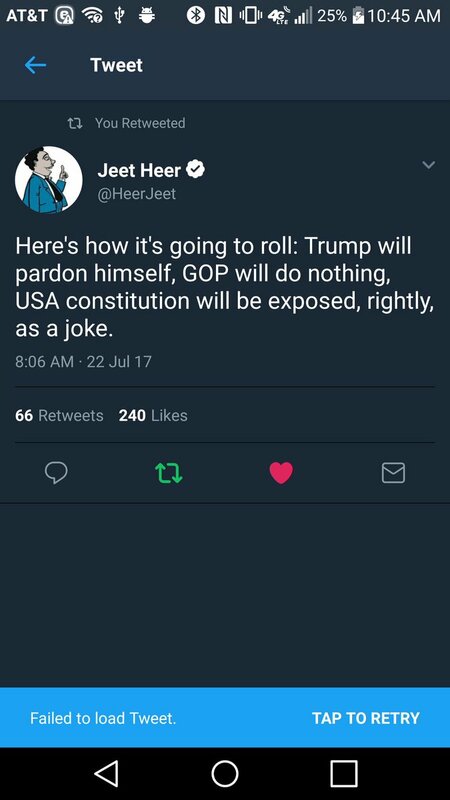 “Here’s how it’ll roll,” tweeted New Republic writer Jeet Heer. “Trump will pardon himself, GOP will do nothing, USA constitution will be exposed, rightly, as a joke.” He later made some modest edits to the tweet after an avalanche of criticism, but it’s consistent with his longstanding view that the Constitution just isn’t equipped for the modern hyper-partisan era, a view well in line with that of such writers as, say, Vox’s Matthew Yglesias and Dylan Matthews, and with the endless claims that each new Trump development represents an unprecedented constitutional crisis. The Constitution is a poor document for partisan politics, the claim goes, since the elaborate system of checks and balances presupposes that institutions such as Congress will place their constitutional mandate above partisan considerations. But this is a bad argument. First, we should note that this is precisely the opposite of the argument for the insufficiency of the Constitution advanced during the Obama years. The case from 2009 to 2016 — as chronicled, for instance, in this Jeffrey Toobin piece — was that the Constitution created so many veto points that it was too hard for the president to enforce his policies. So we should be skeptical from the outset that liberals have noticed a serious flaw in the Constitution; more likely, they are redirecting the frustrations of a party out of power onto the country’s founding document, just as they did when in power. Nor should we passively accept the liberal premise that American institutions have comprehensively abandoned their constitutional obligations. Without getting into the legal complexities here, a few realities stand out: We are only six months into Trump’s presidency, Mueller’s investigation is very much ongoing, and the facts of the Trump–Russia matter are in considerable dispute. No serious person has suggested something so drastic as, say, impeachment yet. Further, it simply isn’t true that the GOP has done nothing. As Josh Barro points out, congressional Republicans have in fact done much to chastise a president of their own party: Both houses of Congress have passed sanctions on Russia, congressional committees have aggressively prosecuted the investigation into the Trump campaign, and many of the most prominent Senate Republicans — from John McCain to Mike Lee — have repeatedly and publicly rebuked Trump in ways that no Senate Democrat would have rebuked Obama. The Senate could easily have chosen not to go forward with a very public and divisive repudiation of Trump’s policy on Russia; it could have declined to schedule televised hearings where Democrats could interrogate Trump’s behavior before millions of viewers; it could have stayed mum whenever he said something they found distasteful. Yet Republicans went ahead, forsook partisan advantage, and departed from the president every time. Why? The simplest explanation strikes me as the most likely: They felt it was their job. Is it really so ridiculous to believe that, at least in this respect, the Constitution is still somewhat functional — that senators possess a great deal of reverence for their chamber and wish to defend its dignity even at the expense of their president? Too often we talk about American institutions as if they have everything to do with the Constitution and nothing to do with us. Also, think what you will about the performance of Congress, but even if it were thoroughly derelict in its duties, it is only one of several institutions tasked with preserving the constitutional order of American governance. The courts have been, to say the least, aggressive in pushing back against what they see as executive overreach. The media have been unrelenting and unrestrained. Federalism has done its share of the work as well: The states almost unanimously rejected the administration’s request to supply data to Trump’s voting commission, and they have largely been behind the litigation to contest the travel ban. Indeed, it is hard to take a broader view of the American polity and not come away with anything but a positive view of the Constitution. Robust free-speech protections mean that creeping authoritarianism is far less plausible here than in the United Kingdom or Germany, which have effectively criminalized dissent from the official state attitude toward Islam. The much-respected tradition of an independent judiciary tasked with protecting constitutional norms serves as an implicit check on the president’s authority and makes a unilateral assault on American rights extraordinarily unlikely. Federalism partitions an enormous degree of political decision-making away from the executive (and from Congress as well). The explicit enumeration of executive and congressional powers in the Constitution provides another partition, ensuring that Trump’s political ambit remains more tightly encompassed than that of, say, France’s Emmanuel Macron. The bicameral nature of our legislature makes it harder to unite around unpopular legislation — as Republicans have found with health care — thereby limiting what Trump can do even with an acquiescent Congress. There are, it is true, areas where the Constitution makes it harder than necessary to check the executive branch, particularly if Congress is sidelined by partisan considerations. The pardon power is very broad, leaving impeachment and removal from office as probably the strongest check against Trump’s firing Mueller. And yet the bar for removal is a hard one to clear, since it requires two-thirds of the Senate — which today means every Democrat and independent and 19 Republicans — after a majority vote for impeachment in the House. How frightening it must be to have your own independent counsel and staff appointed, with nothing else to do but to investigate you until investigation is no longer worthwhile — with whether it is worthwhile not depending upon what such judgments usually hinge on, competing responsibilities. And to have that counsel and staff decide, with no basis for comparison, whether what you have done is bad enough, willful enough, and provable enough to warrant an indictment. How admirable the constitutional system that provides the means to avoid such a distortion. And how unfortunate the judicial decision that has permitted it. Finally, the pardon power too gives the president a great deal of power with little oversight, and I find myself wondering sometimes if it should be handed over to Congress. But there are upsides to the pardon power too: I think of how Jefferson pardoned those convicted under the blatantly unconstitutional Alien and Sedition Acts and my doubts fade away. The point here is not that the Constitution strikes every balance correctly — between excessive and insufficient presidential authority, between an enfeebled and an overpowered executive branch. The point, rather, is that these are very tricky questions and that any criticism of the existing arrangements, which after all have served us well for quite some time, should at least be coupled with a serious argument and a consistent alternative vision. There is precious little such seriousness in the current debate. The compromises, misjudgments, and failures of the men in Philadelphia haunt us still today. But the founders also left just enough room between the lines to allow for a continuing reinvention of their work. On some occasions, as with race and gender discrimination, the Constitution is renewed and improved in courtrooms; on others, as with the Senate’s recent act of self-improvement [filibuster reform], the government finds ways to repair itself. Take a moment to consider what Toobin’s view of the Constitution entails. If you really believe that the Constitution admits “continuing reinvention,” and that it is “renewed and improved in courtrooms,” then the document becomes a reflection on the present state of your political movement. Whenever a supposedly worthwhile political end cannot be stealthily implemented through the courts, you will take it as an indictment of the Constitution itself. Another reason for the low quality of our debate is that we expect the Constitution to do too much. Only a minority questions whether the Constitution is necessary for our political health, but it’s delusional to assume it should be sufficient. The writers of the Constitution certainly made no such assumption: It was well understood in the nation’s early days that a healthy republic depended on a virtuous citizenry devoted to the principles that the Constitution aimed to reflect. Yet we too often talk about American institutions as if they have everything to do with the Constitution and nothing to do with us. It is true that if we elected a president who did not have our best interests at heart, and Congress decided to abdicate its constitutional responsibilities, and voters decided to let them get away with it, and the courts decided that they didn’t care, and the states decided that they would rather sit out the ensuing fight, the Constitution would not help. But how could it? It’s incoherent to look around and see, as Heer sees, an America where the citizenry vote for poor leaders, where congressmen fail to abide by their oaths of office, where our remaining institutions are incompetent or lazy or corrupt — and to claim that the problem is with the Constitution. If that were really our state of affairs, then no constitution could save us.